Undesirable or invasive woody vegetation threatens the biology and ecology of grasslands and native woodlands. Understanding various techniques for applying selective herbicides improves success of woody plant control. High volume foliar herbicide applications are the most cost-effective method for controlling invasive woody plants. It is important to thoroughly cover all stems and fully emerged leaves, including the tops of the woody plants, with a dilute herbicide/water mixture. Control will be greatest with complete coverage of the target plant with the herbicide mixture. The combination of Milestone® and Garlon® 4 Ultra specialty herbicides is recommended to improve control of some woody plants. Herbicide options and tank mixes are shown in Table 1. 1. Do not apply more than 3.3 oz per acre per growing season in a broadcast application or 6.6 oz per acre on 50% of the site. 2. For small trees only, 3 feet (in height) or less. Mix herbicide with 100 gallons water. The addition of surfactant is recommended. Spray to thoroughly wet all leaves and stems. Treatments can be made until leaves begin to change color in autumn. Review label guidelines for mixing and application. Follow label instructions. (Shaded bar indicates an effective herbicide treatment for that species). Herbicide applications to woody plants growing in or adjacent to standing water must follow state and federal permit requirements for aquatic environments. 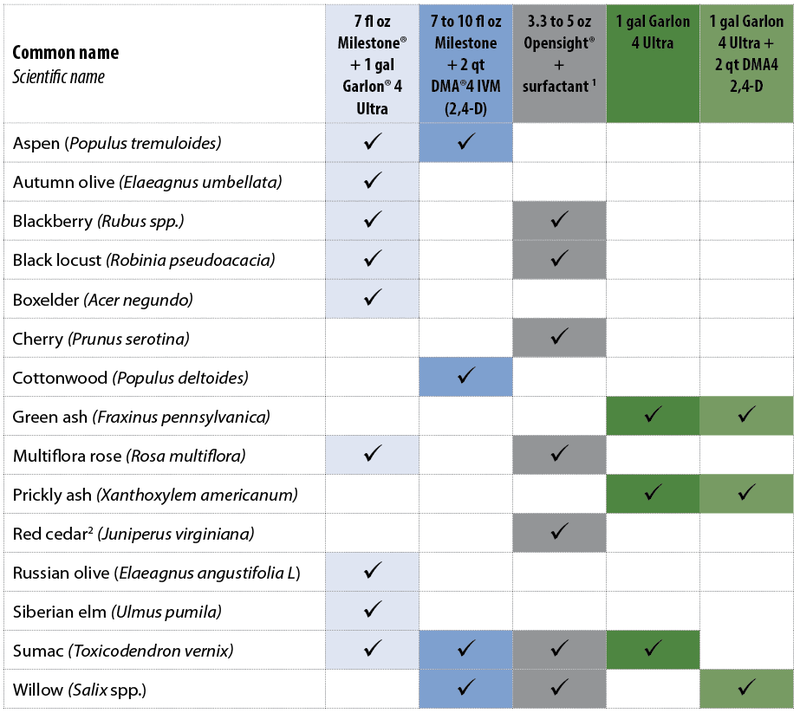 On these sites, the control recommendation for all woody species listed in Table 1 is 2 quarts Garlon® 3A or Vastlan® specialty herbicide + 2 quart DMA4 + 1 quart of aquatic approved surfactant (0.25% v/v) with 100 gallons of water for high volume foliar application to leaves. Surfactants labeled for aquatic use are available from your herbicide supplier. This treatment may not provide the best control for all species, but it is the right option to use in areas where the spray solution will contact standing water. Basal treatments on undesirable brush and vines are suited to sites such as fencerows and embankments, urban settings, near desirable vegetation, sensitive areas, and sites with low-density brush and/or vines. Fall, winter, and early spring applications provide the best access for basal applications due to the lack of existing foliage. Effective application/control method for trees too tall for foliar application. Application is less labor intensive than mechanical removal or tree injection methods. Controls trees and brush that are too large for foliar applications. LOW VOLUME BASAL (LVB) treatments are well suited for controlling individual woody plants near desirable vegetation or sensitive areas, in low density brush situations, and for trees less than six inches in diameter that are too tall for foliar application. Garlon® 4 Ultra specialty herbicide plus basal oil is recommended for low volume basal treatments. Basal bark oils are available from your herbicide supplier. Prepare the herbicide/oil mixture by mixing 25 percent Garlon 4 Ultra with 75 percent oil-based carrier (Table 2). Apply the herbicide solution entirely around the circumference of the stem in a band 12 to 15 inches wide, until the stem is thoroughly wet, but not to the point of runoff or puddling (Figure 1). Table 2. LOW-VOLUME BASAL and BASAL CUT STUMP tank-mix guide for Garlon® 4 Ultra specialty herbicide alone and in combination with Milestone® specialty herbicide, plus oil-based carrier. A mixture of Garlon 4 Ultra plus Milestone with oil-based carrier may improve control of some woody plants. These mixtures can be applied any time during the year except when bark is wet from heavy dew or rain. Pathfinder®II specialty herbicide is a ready-to-use formulation so mixing is not required; however, it becomes too thick to spray out at temperatures below 30⁰F.